I am slowing working my way back to beading and creating a special piece of Bead Embroidery for me. The face is ceramic by Earthenwood Studio. The stone is brown turquoise. I got it from Beki on the Bead Cruise. I am going to let my muse make the call with chain and surface embellishments. BTW April 27, a photo by noeasybeads on Flickr. It is a mystery to me how you and others who do this bead embroidery (am I getting that right?) do what you do. This is so lovely. I love anything that Miss Melanie creates and that stone looks like caramel dipped in chocolate. Enjoy the day, Miss Beverly! 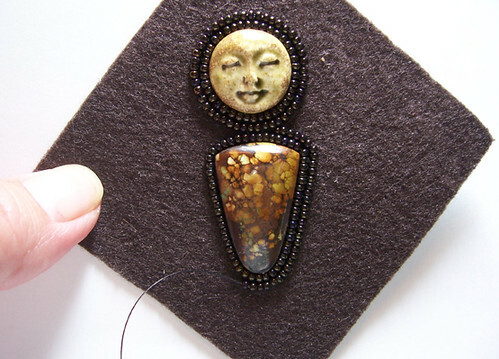 The face bead and stone seem to be made for each other and of course your wonderful seed beeding brings it alive.